This product has all the benefits of regular Super-Zyme with the addition of high foaming agents to ensure complete coverage in sewer lines and drain pipes. 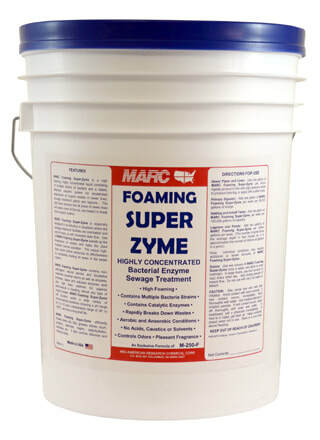 Foaming Super-Zyme is a highly concentrated bacterial enzyme liquid with catalytic agents to help relieve overloaded digesters and sewage treatment facilities. It is specifically designed to speed up the breakdown of organic wastes. It accelerates digestion, controls malodors and works under a wide variety of environmental conditions.